The Campers Trail is the most scenic path in Port Crescent State Park. The trail, a 2.3-mile loop with a 0.3-mile cutoff spur, lies in an area of the park completely surrounded by water, with the Pinnebog River to the west, the Saginaw Bay to the north, and the Old Pinnebog River channel everywhere else. The access point used here is from the campground where a chimney monument and display recount the story behind Port Crescent, the town. By using the cutoff spur, you can shorten the hike to either a 1.3- or 1.1-mile walk, but you would then miss some of the overlooks. The entire loop is an easy trek with only gentle climbing that can be handled by children as young as 5 or 6 years old. Hikers take to the trails March through December, relinquishing them only to skiers in the winter. October is unquestionably the best time, since the park is empty of campers and sun worshippers, and the fall colors of the oaks and maples that forest the dunes reach their brilliant peak. If you come in the early morning or at dusk during the fall, you might even spot a deer or two feeding on the acorns along the path. From the Port Crescent modern Campground, you begin kicking off your shoes or boots and scrambling through the mouth of the Old Pinnebog River Channel toward the yellow post at the base of some small sand dunes. The yellow spur trail quickly rises to the first scenic vista and bench where you get a view of the old river channel, the chimney monument, and the campground below. From here, the blue loop begins, with posts descending south along the old channel or west through a wooded ravine. Turn right (west) to begin the most impressive section of the trail. The trail passes through a ravine of sorts, forested in hardwoods, and away from the water and sand for 0.3 mile. Keep an eye out for blue diamonds on the trees, for the trail takes a sharp turn to the north to reach an overlook of the bay, shoreline, and the open dunes that border it. At Mile 0.7, you’ll reach the junction of the red and blue loops, marked by a large pole and another bench. Head south (left) to return to the yellow spur and reduce the walk to 1.7 miles; but continue west (right) for more views. Follow the red poles and diamonds, and shortly the trail will emerge at another bench with a panorama of the mouth of the Pinnebog River, the sandy shoreline of the Saginaw Bay, and a long line of open and grassy dunes that stretch to the west. This vista is the best in the park, maybe in all of Michigan’s Thumb, and even more remarkable considering the flat fields of corn and navy beans you drove through to get here. At your feet is a steep slope of sand leading down to the river, while on the opposite riverbank are usually a handful of anglers trying their luck for perch or panfish. If it’s September or October, they are probably fishing for Chinook salmon that spawn upriver. The trail continues along this sandy bluff above the river until it reaches one final bench at Mile 1.1, where you can see much of the Pinnebog River Valley and the wetlands that border it. At this point, the trail swings to a southerly direction, and then to the east, becoming a walk through woods. Follow the red diamonds carefully, for there are numerous unofficial paths cutting through the open forest of oaks and maples. If it’s early or late in the day, hike quietly and be alert; deer are occasionally seen feeding along this stretch. At Mile 1.5, you reach the organization campground (vault toilets and a picnic shelter) and then the junction at the old iron bridge, now used only by hikers and skiers to reach the second trailhead and parking area. Entering from the north (let) is the cutoff spur. Continue along the blue loop by dropping down toward the bridge to pick up the trail that skirts the old channel closely. Eventually the trail begins to climb gently again, and within a half mile tops off at the first overlook and bench, where the yellow spur leads back to the campground. Port Crescent has 142 modern sites located in a partially wooded area in the east half of the park. 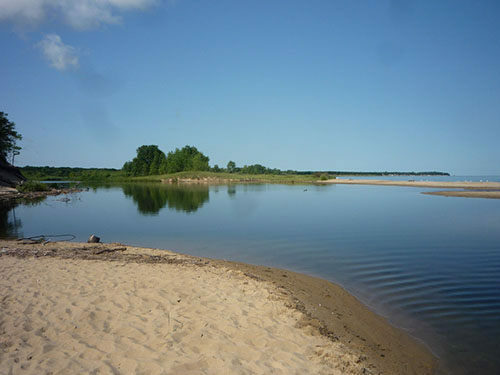 In the west half of the park is a day-use area with picnic tables, bathhouse and the finest beach in the Thump Region of Michigan. 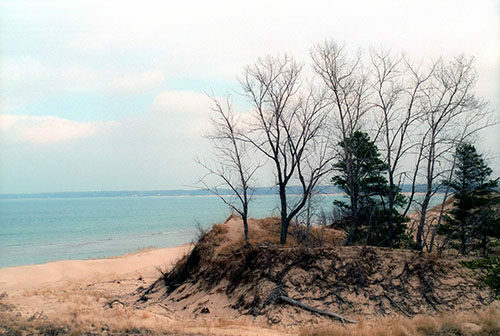 Port Crscent State Park is open year-round. A vehicle permit or annual state pass is required to enter the state park. 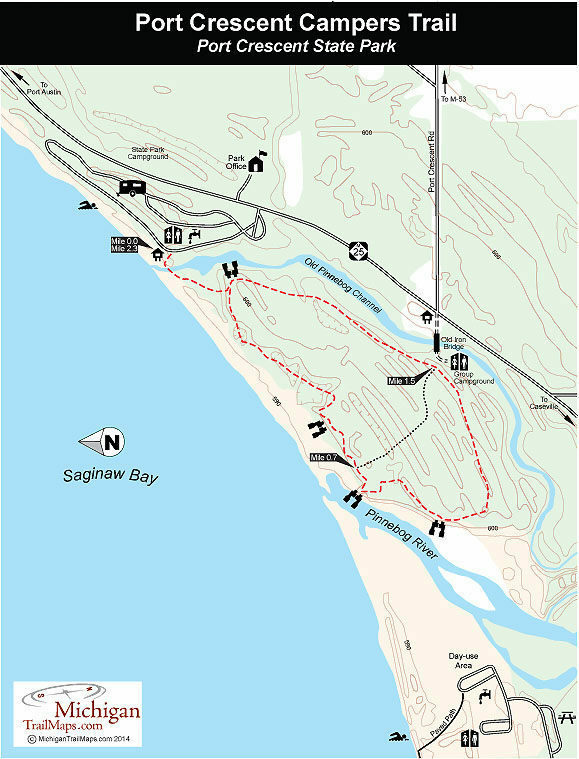 Port Crescent State Park is located 5 miles west of Port Austin on M-25 and is split in half by the Pinnebog River. The trail area is in the eastern half of the park. 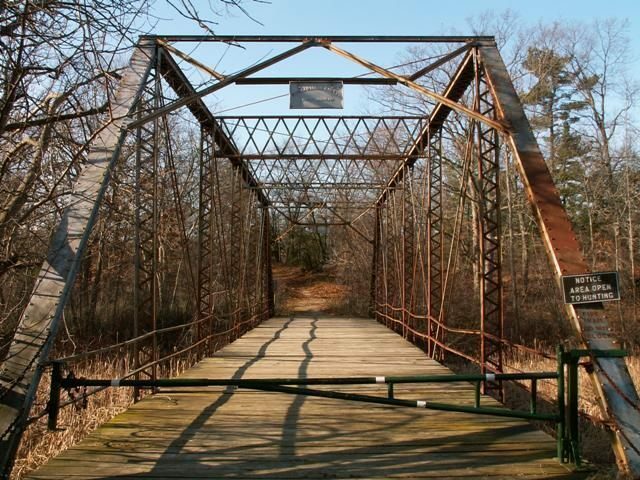 One trailhead is the old iron bridge at the corner of M-25 and Port Crescent Road, providing direct access to both the blue loop (1.3 miles) and the red loop (1.1 miles). The other trailhead, where this description starts, is located in the campground, whose entrance is posted on M-25. Begin the hike across from the modern rest room between two beachfront sites. If the campground is not overflowing with too many vehicles and campers for your pleasure, this is the best place to begin the loop. Contact Port Crescent State Park (989-738-8663).